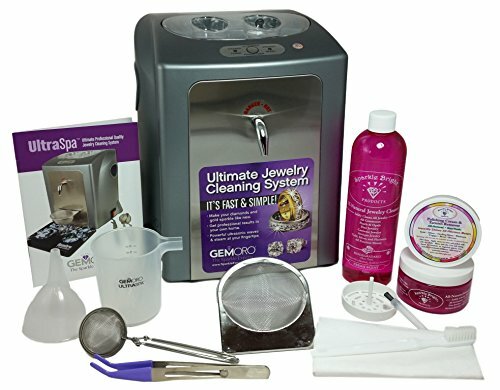 The UltraSpa is a professional quality machine that provides ultimate cleaning results for sparkling diamonds, gold, silver, platinum jewelry, metal watch bands and more. The UltraSpa has both powerful ultrasonic cleaning and high-pressure steam cleaning in a single appliance. With a two-stage cleaning process, scrub dirt and grime with intense ultrasonic sound waves and then with the steamer blast away hidden dirt and the remaining residue from all hard to reach areas with amazing results. NOTE: Do not use with pearls, opals and/or costume jewelry. • Safe to use every day. Use on: diamonds, costume/designer jewelry, all soft stones including pearls, opals, and gemstones. • DIRECTIONS: Put 2 capfuls of the liquid cleaner in the machine with water OR for Fine Jewelry - Soak in liquid, brush with a soft toothbrush if desired, rinse with water, and dry. For costume jewelry or soft stones, swish in the liquid cleaner, brush if necessary, rinse with water and dry. For glasses or goggles, dip in liquid or spray on and use a soft cotton cloth. • Use on: rings, necklaces, bracelets, watchbands, coin collections, tea sets, etc. • Metals: gold, silver, sterling silver, platinum, palladium, titanium, etc. • DIRECTIONS: Apply cream to metal with a cotton cloth using a circular rubbing motion until the tarnish is gone. Black tarnish will be on your cloth. For crevices and hard-to-reach places, use a soft toothbrush dipped in the cream. Wipe with cloth, rinse with warm water and dry. Use Q-tips to clean small silver links. Use once a month to maintain shine. • For glasses, computer screens, goggles, and to polish and remove tarnish. Non-chemically treated - does not remove tarnish by itself.